Part of the itinerary is an historical stop at the Museum of the sinkhole "Foiba di Basovizza". 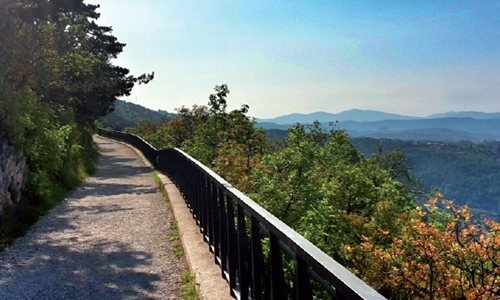 The tour continues toward the lookout-post San Lorenzo, overlooking the beautiful Rosandra valley and then passes through S. Antonio in Bosco, where you can take the Cottur track in the direction of Trieste. Following the signs, you will arrive at the Obelisk of Opicina. From here you will take the Napoleonic trail overlooking the amazing Gulf of Trieste and you will reach the Sanctuary of "Monte Grisa". The way back to Basovizza passes through the villages of Trebiciano and Padriciano. You can easily rent a bike in the karst surroundings from Trieste Bike, which also offers guided E-MTB tours.